Why future racing copters really should look different. 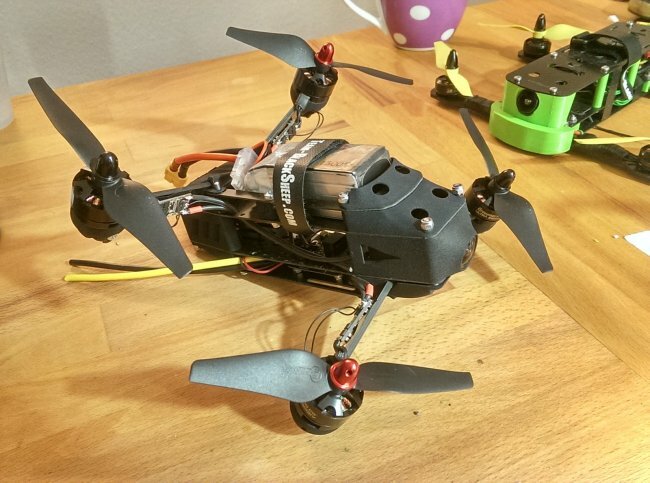 In this article I try to demonstrate why FPV racing multirotors need to look different. Some small modifications to the frame would (in theory…!) result in 70 % higher top speed! All that needs to be done is to align the arms parallel to the propeller flow, and to tilt the main body of the copter by about 40 degrees. I am presenting a very simple and robust racing copter design that incorporates these ideas. Furthermore, I am calculating the aerodynamic drag of different copter concepts using basic equations. The aim of this article is to make you realize the importance of aerodynamics and to stimulate people to design more innovative racing frames. Until recently, multirotors were mainly used as a “hovering device” and the top speed of these copters did hardly matter. 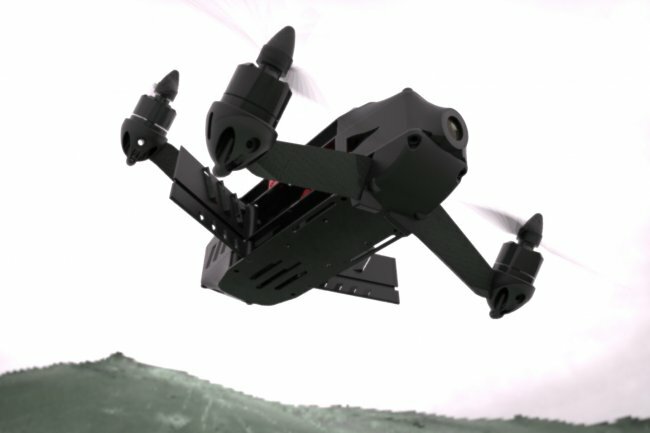 Now, multirotor racing has become popular and all competitors are seeking for very fast and agile multirotors. 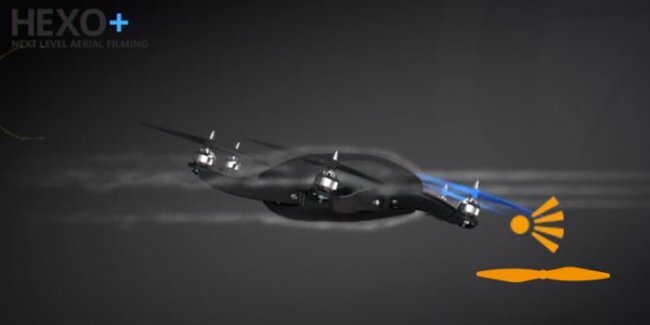 Apparently, the aerodynamics of multirotors have been neglected in the past (with a very few exceptions), but aerodynamics actually become very important at increasing flight velocities. 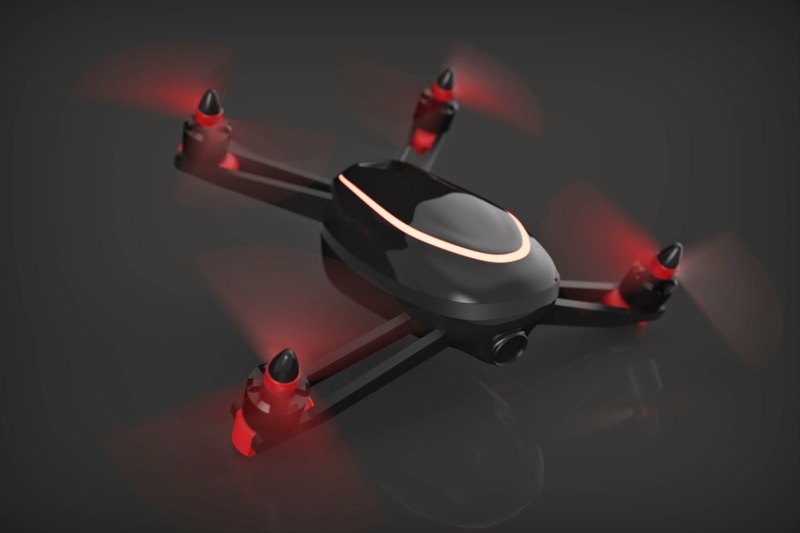 Just as a quick example with numbers that are realistic for copter racing: A quadrotor that weighs 0.7 kg and flies at a pitch angle (alpha) of 45 degrees has an aerodynamic drag that is also 0.7 kg (about 7 N) – which is clearly very significant. A large portion of the force that is generated by the motors is therefore just “wasted”! If this drag could be somehow reduced, then a racing copter could fly a lot faster (or it could fly longer at the same speed). The flow that is hitting the main body or frame is mostly horizontal, as it is hardly influenced by the propellers: It is mainly exposed to the flow velocity that results from forward flight (I however really need to verify these assumptions in a windtunnel or with in-flight measurements, I'll do that asap and report the results here). 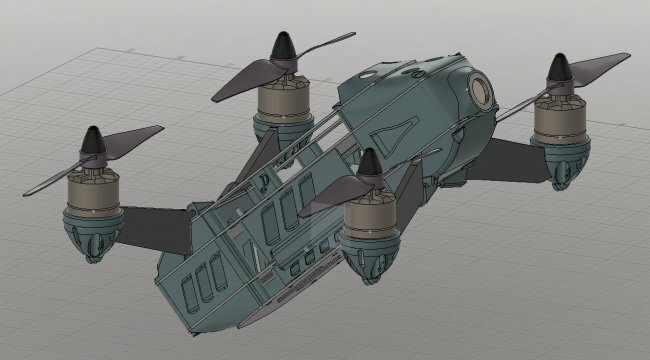 It would make a lot of sense to reduce the drag of the arms below the propellers, and to reduce the drag of the main body of the racing copter. My first and simple idea to achieve this was to tilt the motors forward, and to design an aerodynamic canopy. These ideas were implemented in the “Shrediquette Gemini” in 2013 (which was later produced by Team-Blacksheep). 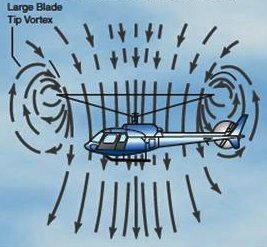 Some force measurements in a wind tunnel revealed that these two features reduced the drag of the copter by 14 – 40% (depending on the pitch angle). My next idea was to tilt the body instead of the propellers. The goal was to align the body with the oncoming, horizontal flow, which will significantly reduce the aerodynamic drag. 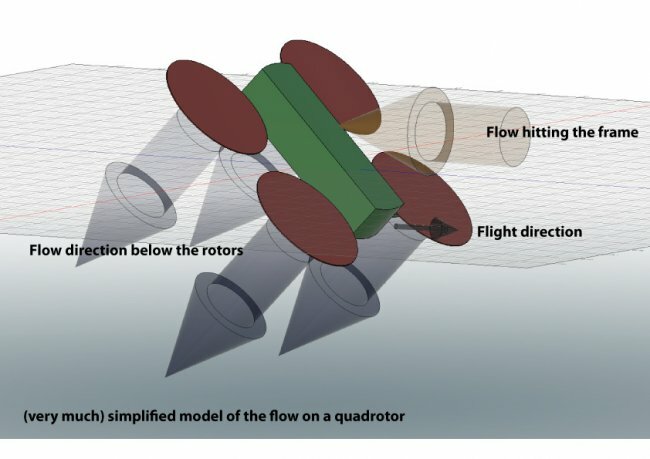 If the arms are aligned parallel to the propeller flow (= perpendicular to the propeller disk), the drag will be further minimized. My HEXO+ design (which was used in a Kickstarter project too) realized the idea of a tilted body. 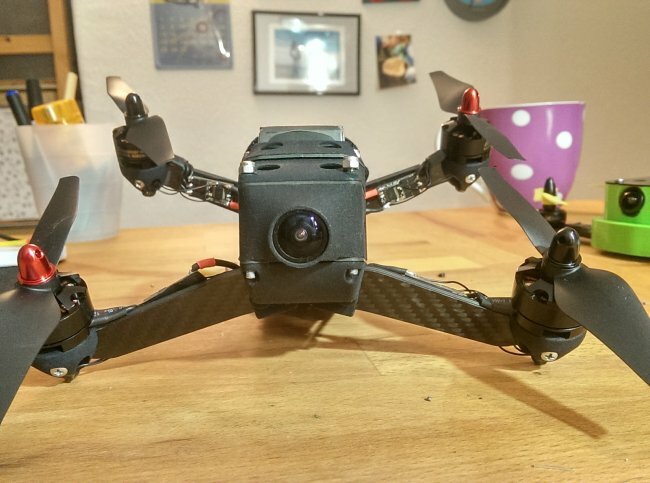 Recently, I realized that a frame like the QRC5 is not crashproof enough for everyday FPV racing. Therefore I recently finished a “classical” FPV racing copter design that incorporates the idea of a tilted body and arms that are aligned parallel to the propeller flow. The “Shrediquette DERBE” is probably as crashproof and light as conventional racing copters, but it has much less aerodynamic drag. The following image nicely illustrates the two main sources of drag as introduced earlier, and how drag is minimized in the Shrediquette QRC5 and the Shrediquette DERBE. 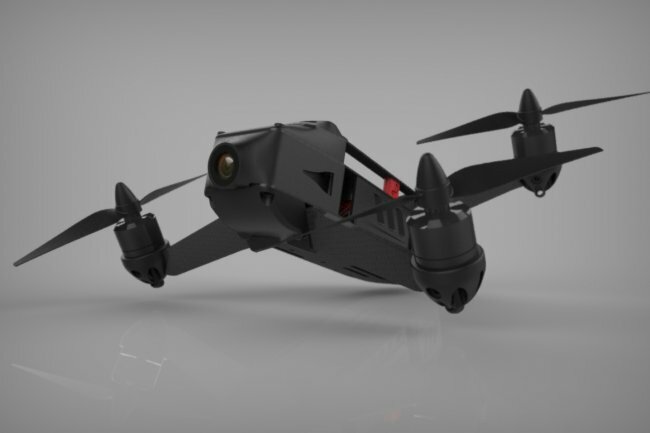 The idea is to minimize the frontal area of the copter at typical pitch angles (about 50 degrees in FPV racing), and to minimize the area under the propellers. The aerodynamic effects and the performance of these different frame concepts can be approximated by applying some relatively basic equations. I did the calculations in Matlab (source code here) with a numerical, iterative method. I am sure there’s an analytical way to solve the equations, but rearranging these equations would take me much more time than just letting Matlab do all the work for me… Here is how the aerodynamic drag, and the top speed of three different copters (standard, QRC5, DERBE, each with the same motors, propellers and weight) are calculated. 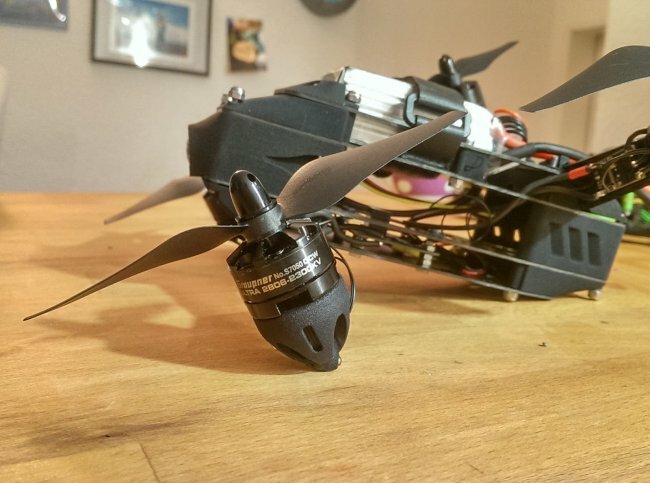 The numbers that I am using a suitable for MN1806 2300kV motors with 4S and 5x4” propellers: The most difficult part of the calculations is to approximate the thrust that is produced by the motors. 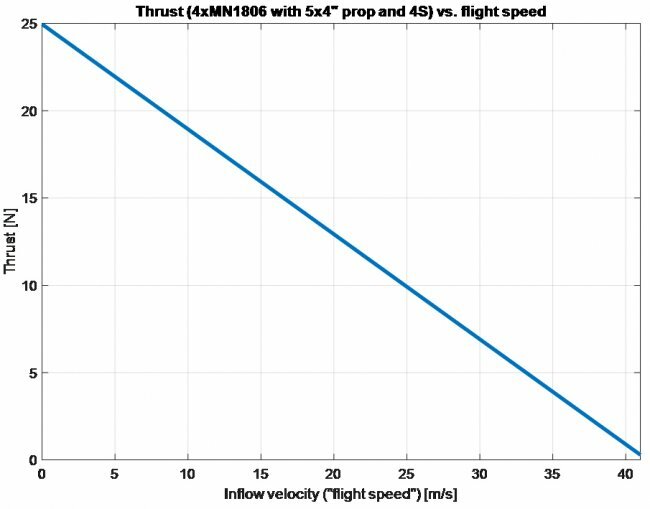 Thrust decreases linearly with flight speed (if the rotational speed of the motors would be constant) until it goes down to zero at some flight speed. Thrust at different flight speeds is not so easy to measure, therefore I am using an equation that seems to fit experimental data from a wind tunnel reasonably well. I am however planning to do real windtunnel measurements of the propeller performance in forward flight very soon. Furthermore, I am assuming the flow to be perpendicular to the propeller disk below the propellers. The main body of the copter experiences flow that is purely horizontal in this simplified calculation. The copter is set to a pitch angle (alpha) of 1 degree and full power is applied to the motors. 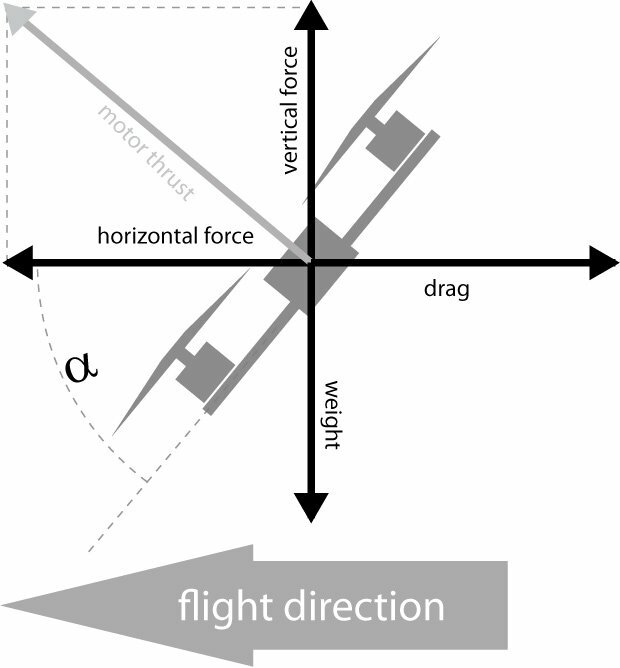 The horizontal drag of the main body is calculated from the dorsal and frontal area of the main body at alpha, together with a drag coefficient of 1 (which is a reasonable approximation for a classical racing copter frame) and a horizontal velocity. 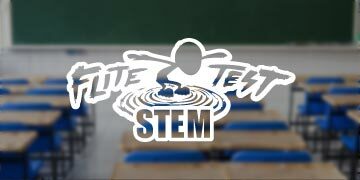 Additionally, the drag of the arms needs to be calculated and subtracted from the available total thrust: The flow velocity in the jet of the propeller is (based on the equations already mentioned above) approximated to be about 150 km/h and independent of the flight speed. A drag coefficient of 1.5 is assumed. To give a number already: The drag that is created by the arms of the “standard racing copter” at full throttle is 6 Newtons (about 0.6 kg)! 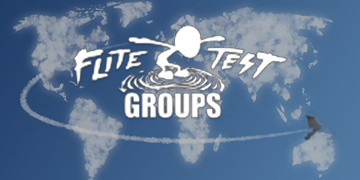 This is equal to the static thrust of one motor…! With the remaining thrust, I am calculating the horizontal and the vertical force component at the current pitch angle of 1 degree. Now, the horizontal velocity is increased step by step until the drag equals the horizontal force component. If this is the case, then the pitch angle is increased by one degree and the calculation starts from the beginning. At each increase of the pitch angle, I am checking whether the vertical force component is larger than the weight of the copter (as a side note: I am completely ignoring the vertical velocity of the copter as I am only interested in the final solution where drag equals horizontal force AND weight equals vertical force). At a certain pitch angle, the vertical force is not larger than the weight anymore. At this point, the calculation stops and both the pitch angle and the velocity of the copter are printed. The numbers for the “standard racer” seem pretty realistic, although I am quite sure that the top speed is always overestimated. It is very likely that there are additional sources for drag on a copter that were ignored in my simplified assumptions, and that the hypotheses on thrust vs. flight speed could be improved. However, I am doing the same errors in the calculations of all three copters, therefore the above results represent the correct trend: Aerodynamic designs fly much faster and at lower pitch angles. 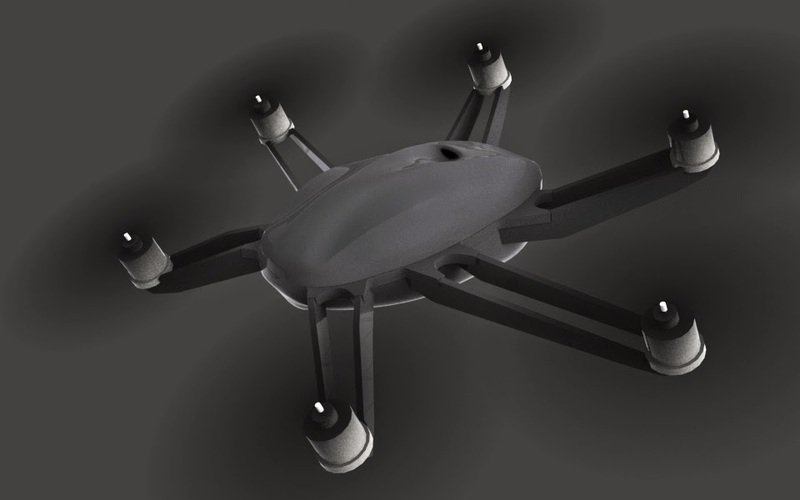 These two factors a highly relevant in FV multirotor racing and in the future, more attention should be paid to designing simple aerodynamic copters like the Shrediquette DERBE. Furthermore, I will be experimenting with optional airbrakes in the first prototype. These will be deployed at very low throttle and when the throttle is quickly reduced (hence reacting to the derivative of throttle). In my imagination, this could really help on tight racetracks, as it enables the pilot to brake without having to change the pitch angle (which would take more time and also results in a camera that points to the sky). Hi, thanks, I'm doing this just for fun. This hobby combines quite a lot of my interests, that's why I like it so much :). The arms are 3.2mm. I don't think that the orientation is a disadvantage, because you will not always crash in the same direction... At least I don't... But we'll see, tonight is the first flight I hope. Are you giving out the plans for the derbe? I really fell in love with it, I would even buy the plans! Great article! Most of it was over my head, but I am excited to see this type of innovation in the quad racer realm. There are way too many versions of the same H quad out there. 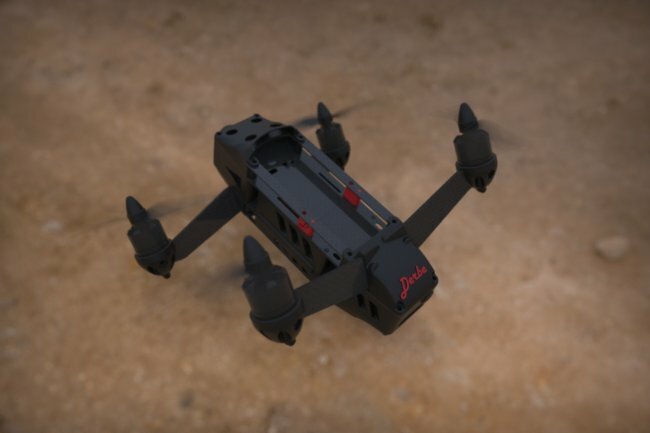 I could see you adapting a versacopter frame to this orientation with the front arms below the plate and the rear above. Can't wait to see your flight videos and where this ends up. 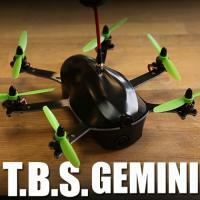 Maybe the next release for TBS? Good to have an article from you on FT. 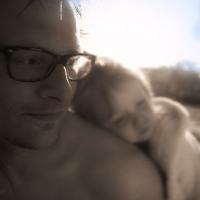 I learned about your work from you website/blog when Team-Blacksheep Gemini was being released. The work and projects that you have are amazing and I am a fan of yours. I have also quickly gone through the above article and wanted to bring some thing very important for you consideration. 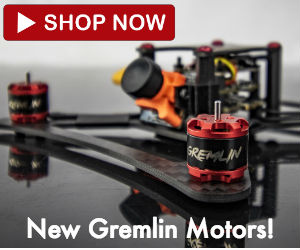 It seem like that for 'FPV Racing', the drag that you are envisioning to minimize is infact beneficial for faster lap times. It seems like this very drag acts as a 'Drag Break' for short and tight racing circuits. Of course if the FPV race was a long run from point A - B without any turns, the top speed would have been the only factor. For more information on this, please visit the following writing from David's RCExplorer Website. I am sure you know about him. In short, he is big into tricopters, and recently came up with a mini-Tricopter and when racing with 250 quads on short circuit course came across the above problem of no natural drag break on his mini-tricopter. Just wanted to share the above with you to help with the feasibility and objectives of your project. Hi, thanks, this is a very good point: And the DERBE is prepared for it...: On a conventional multirotor, the drag (caused by frontal area) increases with the pitch angle. That means when you pitch the quad a lot and want to go fast, then the frontal area and the drag become very high. When you need to deccelerate, you would decrease the pitch angle - which will result in less frontal area and less drag. Both things are exactly what you NOT want. It will result in a more or less "constant" flight velocity with relation to the pitch angle. On the DERBE, it's different. The faster you want to go, the more you pitch forward, and the smaller the frontal area and the drag become. If you need to brake, just reduce the pitch and you'll have a huge frontal area that slows you down. At least this is my theory, let's check if it's true (maiden today). That sure does make sense.. I seems like you have thought through it.. However, reading Davids explanation, it seems like the conventional multirotor during racing increases or decreases the speed PRIMARILY using throttle (instead of Pitch as you mentioned). That is, once you are pitched forward, you increase the throttle to increase speed (thrust more than the drag - though also results increased amp draw), and decrease the throttle if you want to break (drag more than the thrust). As you rightly said, increase in pitch angle does increase the horizontal thrust, but also increases the drag, and thus canceling a substantial amount of horizontal thrust effect. Thus, David's theory does make sense that that horizontal speed is primary altered by altering the throttle as apposed to pitch angle.. Unless that is some thing i am missing from the equation. Now, if what I am assuming above is true, the lack of required substantial change in the Pitch to alter the speed (acceleration) the conventional multirotor MAY be quite advantages as it keeps it stable (no substantial pitch stabilization computation required), while also keeping the camera frame view stable (for Pilot easy). However, in the above I am assuming that the horizontal acceleration is Primarly controlled by Throttle, which i think is unlikely.. I understand one will have to bring in the Pitch to keep the copter altitude stable, and that changes the entire scenario. If this is the case, than your design is PERFECT. It will have the least drag when speed is required, and the most drag with breaking is required.. Hope it works.. Thanks for your comments. 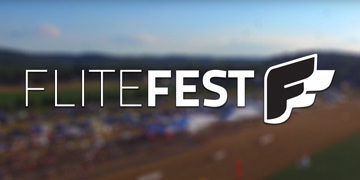 We'll see if racing copters care about my theories... I will most likely also do flow visualizations in a wind tunnel next week. Amazing. Thanks for your work. 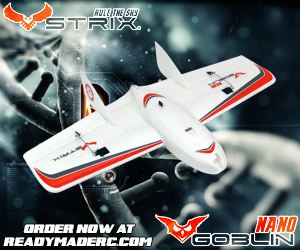 You are a true pioneer within this hobby! Fantastic article, I wish I has access to Matlab so I could build on your work unfortunately I don't have a few grand to burn. 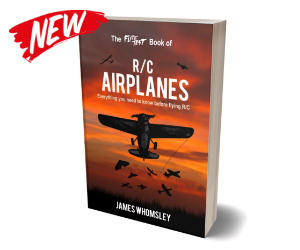 Although I thought you might get some use out of the work APC has done for their propellers ( https://www.apcprop.com/v/PERFILES_WEB/listDatafiles.asp ) that detail the theoretical performance of their propellers. 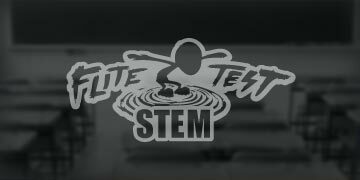 It would allow for a more dynamic range of testing based on alternative propeller geometry and rpm. 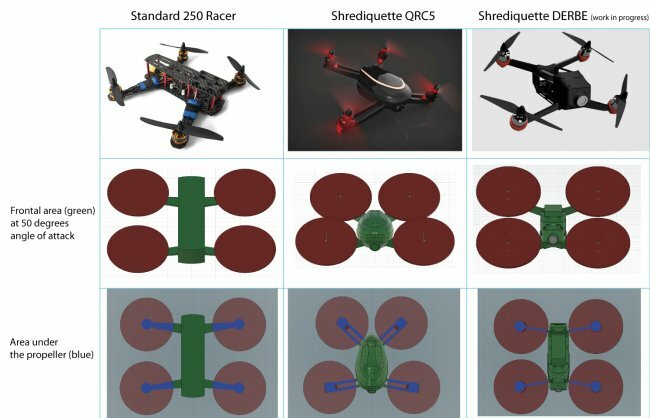 I'm glad to see that someone else is looking to bring some analytical analysis to the design of racing multirotors the flying box car style is rapidly approaching the maximum performance that can be achieved with the current form factor. I am curious what flight controller you are using for these designs? Thanks again for the fantastic article. Ich weiß nicht ob du dich noch an mich erinnerst aber ich bin der junge der die die Graupner Propeller Verkauft hast beim FPV Race in der Sporthalle. Es würde mich freuen wenn du dich bei mir meldest ich habe noch eine Idee für den Shrediquette DERBE.